We have read of tycoons purchasing an entire island or archipelago outright with insane amounts of money, and this is something that only a few of us dare dream to actually achieve. Well, man on the street, it is time you start to think more positively with a “Can do!” attitude, and if I were to tell you that you can bring home your very own island for $329.95, what would you do? 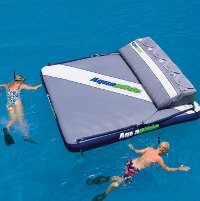 Don’t throw your head back in laughter just yet – the Floating Private Island from Hammacher is exactly what I am talking about, where it provides a place of respite for those who indulge in waterborne activities. It is more than ideal as a lounge, swim raft, or launch pad, where it can hold up to three adults or five children on it. Constructed using durable tear- and abrasion-resistant 600-denier PVC-coated polyester that will cover its inflatable two-chambered, 26-gauge PVC bladder , a quartet of sturdy handles will make it a snap to board, tow, and even transport out of the water. There is a durable strap located in one corner that hooks to a towrope so that it can tow up to three people, while eight stainless steel mooring rings will enable you to connect several inflatable dock systems together.